Still from “Voyage Dans La Lune,” George Méliès, 1902. In July 2011 I gave a talk (which is something I almost never do) at the company in San Diego that eventually hired me in February 2012 to be Senior Mission Specialist for operating the Mastcam cameras on the Mars Science Lab, Curiosity. At the time I’d been working in Ithaca with the Mars Exploration Rover Spirit and Opportunity Pancam cameras for almost a decade. 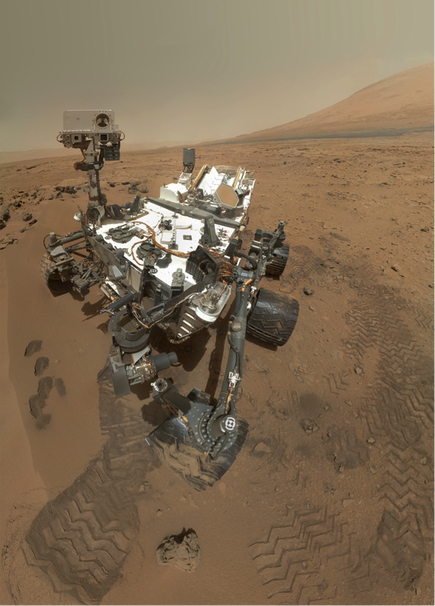 Curiosity was to be the next flagship Mars mission. My first presentation slide was the above image from George Méli&egraves’ 1902 film “A Trip to the Moon,” one of the first science fiction movies. I used this image because I wanted to capture something more than the technical aspect of operating cameras on Mars. The impetus to explode contraptions (and humans) beyond Earth’s gravity to explore space is part of an ongoing story about our existence and consciousness. I grew up in a household where silent movies were regularly shown in our Victorian livingroom. My mother, a poet and musician, accompanied the movies on the piano, often making her own scores. My father, a scientist, made arrangements to rent obscure art movies, dug up stories about the films and filmmakers, and wrestled sometimes unsuccessfully with the projector and wobbly screen. The house was filled with literature and art reproductions, as well as scientific reference books and early science fiction books and pulps. “A Trip to the Moon” was part of my upbringing before real rockets aimed for the Moon. “A Trip to the Moon” is of course a small example of the richness and playfulness of the human mind. But it’s that dimension that makes the intense technical hard work of a real space mission worthwhile. I was an English major in the 1960s, but included a heavy dose of math and science in my studies, perhaps as a result parental influences as well as a natural thirst. In those days, science fiction was not generally considered literature, and too speculative to be considered science. I was like the kid hiding the comic book inside the history book–except it was probably The Martian Chronicles inside an assigned classic. It was science fiction’s blend of speculative scientific thought and acknowledgment of greater possibilities for humanity (not to mention imagination and the sense of adventure) that led me jump at the opportunity to be part of the space program. Students now are far better prepared in math and science than I was. I work in a field with world-class engineers and scientists who have paid their dues with preparation and credentials. Pixels and squiggly lines of data are interpreted with caution and care. But how long would we last sitting in front of a computer screen for long hours if we didn’t experience our role in space exploration as having some flavor of Astounding or Amazing (to borrow some titles of pulp science fiction story collections)? Scientists as a species tend to rein in their speculation, at least in public; sometimes the inspiration is invisible. The pixels and squiggly lines are part of a story that we look for in the martian rocks and dunes and craters. People who work in the space program are from many different cultures in time and space, but there’s something in the human story that unites us. What I have that propels me on the course I’ve taken is that sense of amazement and good fortune to be able to participate in missions that explore and expand our collective view. I have the privilege of operating cameras, our eyes on Mars, that see what humans have never seen before. Sometimes someone will ask to watch me work. I say, “You mean you want to watch me sitting in front of a computer screen all day?” The sense of living out a myth or dream is pretty invisible day to day. But ‘the heart of the matter’ is that it’s a sense of story that holds us together, a story that started long before we arrived and that will continue long after we’re dust. The walls of your office disappear when you’re among the first Martian explorers, a photographer on Mars looking through the eyes of very slow and cautious robotic geologists built somewhat in our image and extending our senses and our story. Humans explore in different ways. I have a friend who lives several miles north of my home on Cayuga Lake. She has spent almost every day of her adult life on her hands and knees picking up millimeter-scale crinoid fossils from her beach, especially in winter when the lake level is low. She photographs the tiny fossils and sometimes assembles them into creations for adornment. In some ways, our pursuits are the same, although she’s an “artist” and I’m a “scientist/engineer”. There’s beauty and science in both approaches, and a search to fill in the details of old, old stories. Why then do the peer-reviewed “stories” published in journals so often fail to enchant and are read by so few? What’s missing that would make the tales of science come to life? Is the dimension provided by the humanities missing–plot, characters, language, vision, beauty?